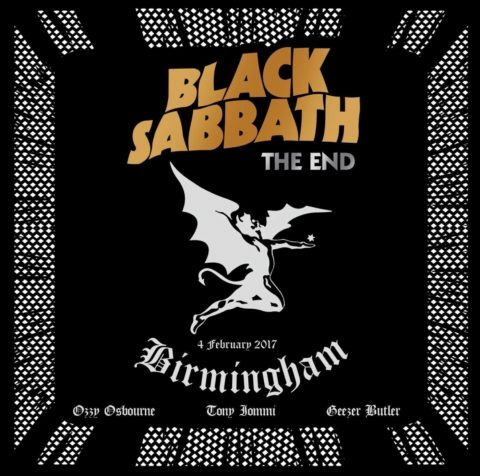 The End is a celebration of Black Sabbath’s final hometown concert at Birmingham’s Genting Arena on 4th February, 2017. This farewell show is out in November in six physical formats, including a five-disc deluxe box set. 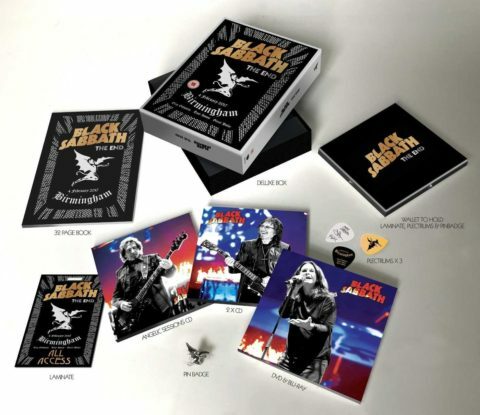 The deluxe box set features The End on DVD and blu-ray (both all region), double CD and something called ‘The Angelic Sessions’ on CD which is a bonus ‘intimate’ live session recorded at Angelic Studios days after their final live performance. You also get a 32-page perfect bound book, a metal pin-badge, replica tour laminate and three plectrums. It all comes in a lift-off lid box. If you want to know what all that looks like, check out the image below (click to enlarge). 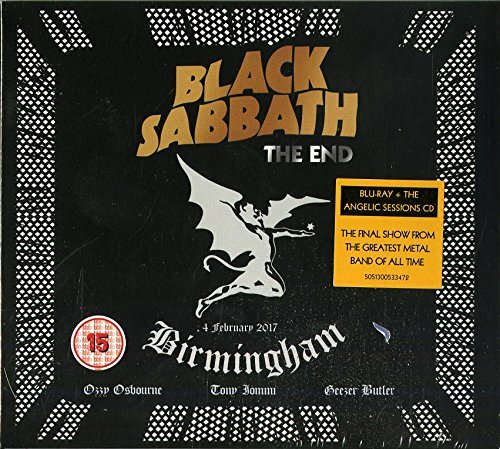 All visual formats apparently feature footage of the Angelic Sessions, but if you opt for the Blu-ray+CD combo edition it looks like the CD is also the Angelic Sessions, not a ‘highlights’ disc of the show, as you might expect. There is also a CD+DVD version. 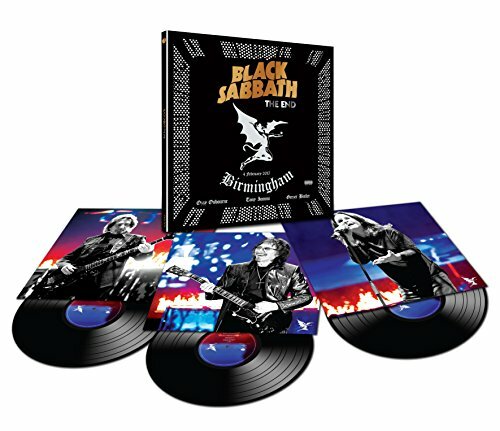 You can simply buy standalone blu-ray or DVD and there is also a two-CD edition and 3LP vinyl, which obviously just feature the audio. 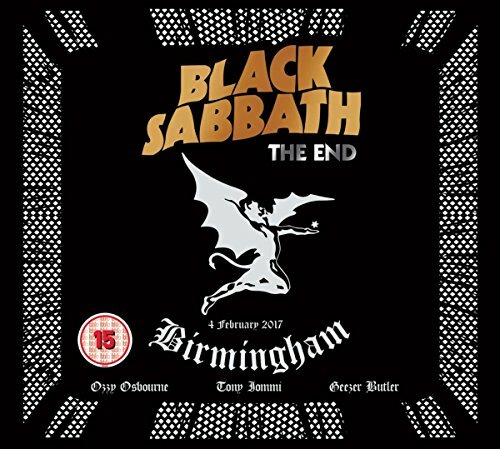 The End will be released on 17 November 2017. Already ordered, I was at the last gig and it was utterly magical, a night I will happily relive again and again. I was also lucky enough to snag a gold edition of the ‘Ten Year War’ box set. The vinyls are great, but the outer box is a disappointment. On one side it’s bubbling slightly, and is just paper over cardboard, not a patch on the Queen outer box. I know this is a big issue, but I would have liked for the very last concert at least one tribute to Dio, playing maybe Heaven And Hell or Neon Knights. I know that the Ozzy configuration of Sabbath never did this, acting like the band didn’t record anything after 1978 (and Ozzy and Ronnie were never good friends), but I think for just once they could do it. I’m not asking something from the Gillan, Hughes or Martin era (although with Tony they did some fine album), but Heaven & Hell is a classic. Hats off to them for pricing the triple vinyl LP set at a reasonable £30. 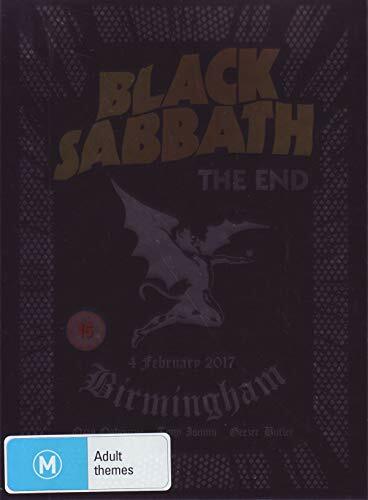 I haven’t seen any mention yet of the Ten year war box set due imminently that encompasses the 70’s vinyl Sabbath catalogue. Already going for silly prices on eBay , Discogs etc. they could’ve dug out some more interesting tracks for their last tour. if I had seen them before (I hadn’t), I would’ve been disappointed by that Vienna show. short as hell too, barely 90 minutes! More money grab, but i’m tempted to get this…this and the david gilmour last boxset. Bill Ward had two heart attacks recently, and the other members of the band were concerned about his health and his ability to play. They didn’t want Bill to play full sets, and he refused. I guess what you’re saying is that you would’ve preferred Bill Ward kill himself on stage or play lousy shows, instead of the band doing its best with another drummer to give fans around the world what they want. Does the video intersperse interviews with the music as per the cinematic version is said to do? Does the 3 LP set come with a download code? 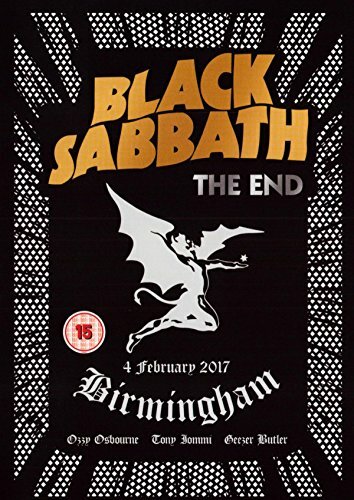 I’ll probably buy this but it really is unfortunate that they did not reunite with Bill Ward for the final gig. His unique drumming was an essential ingredient in the classic Sabbath albums and he deserves to be recognized for his significant contributions, regardless of the issues between him and the other members at this point. Tony explains in the movie why Bill isn’t there anymore…..
I’m well aware of all of the various reasons given by Tony and the others as to why Bill wasn’t on the 13 album and wasn’t touring with them, I just wish they could have made it happen for the last show. Bill has had his health issues but at the very least he could have handled a few songs at the final concert, if not the entire gig. Bill could have taken a page from Gene Simmons’ playbook, and offered to hand deliver the 5 disc version for $2000. The cover art is awful. Agreed, A very low budget mix of logo circa ‘Master Of Reality’ and icon from ‘Never Say Die’ and yes, disappointing cover art. Judging book by the cover is seen as erroneous but you’d have thought more effort would have been spent on what is their final event. Why the CD+DVD is not listed there as an opt, Paul? That Angelic studio sessions with extra songs is also on that combo CD, not only in Bluray combo. Because I didn’t know it existed. Now added – so seven physical options!